Several questions in Pew Research’s latest News IQ survey stumped a majority of the public, including the identity of one very important person. SPOILER ALERT: If you haven’t taken the quiz yet, you might want to do so now before you keep reading. Forbes named her the most powerful woman in the U.S., but Janet Yellen is far from a household name. 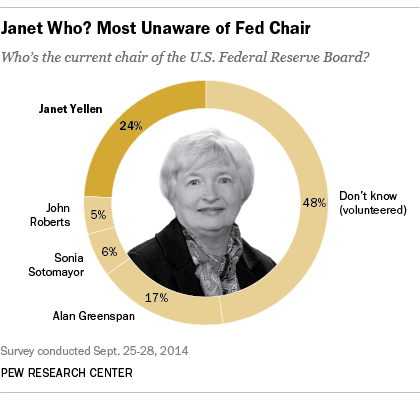 Just 24% of Americans can correctly pick out Yellen — from a list of four — as the chair of the Federal Reserve Board. Nearly one-in-five (17%) say the current head of the Fed is Alan Greenspan, who led the board from 1987 to 2006. About one-in-ten chose a Supreme Court justice, either Sonia Sotomayor (6%) or John Roberts (5%). And roughly half (48%) did not offer a guess. Yellen has been chair of the Federal Reserve since February, when she succeeded Ben Bernanke after eight years in charge and became the first woman to hold the position. In three surveys from 2008 and 2009 — several years into Bernanke’s tenure — Americans correctly identified Bernanke as the Fed chair between 33% and 45% of the time. Of the 12 multiple-choice questions asked on the survey, only two proved harder than identifying the Fed chair: knowing the share of Americans at or below the poverty line and the activity on which the U.S. government spends the most money. Although there is an education gap across all 12 questions, knowledge of the Fed chair is one of the biggest divides between college graduates and others. Fully 45% of college graduates named Yellen, compared with 21% of those with some college experience and 12% of adults with a high school degree or less. Men are more likely than women to correctly identify Yellen (29% vs. 19%). But there are virtually no partisan differences when it comes to recognizing Yellen’s name. About as many Republicans (27%) as Democrats (26%) and independents (24%) know that she leads the Fed. When Yellen began her term in February, we asked the public to give their opinions about Yellen and added her new title. More said they had a favorable (33%) than unfavorable (20%) opinion of Fed Chair Yellen, while most (47%) said they didn’t know or couldn’t rate her. In September 2013, as Bernanke’s tenure at the Fed was coming to a close, many Americans still had not formed an opinion of him; 38% viewed him favorably, 31% unfavorably, with about one-third (32%) not rating him. The public has a basic idea — some would say very basic — about what the Fed does. Our News IQ survey last year showed that Americans have at least some idea about the Fed’s purview: 73% correctly said in an online survey that the Federal Reserve is primarily responsible for monetary policy out of a list of four options (tax, trade and energy policy were the others). Yet an Associated Press/Gfk Knowledge Networks poll in July found that most Americans said it is difficult to decipher the Fed’s policies on interest rates. Seven-in-ten said it was hard to understand the Fed’s interest rate policies while only 27% said it was easy (including just 7% who said it was very easy). On the other hand, the same poll found majorities saying other government policies – such as government surveillance policy and the health care law – also were difficult to understand.